16 and 17 April 2018 we held an Introduction Hydrography course at our office in Voorschoten. 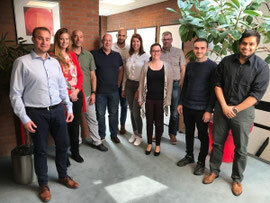 We welcomed 9 participants, employees of Geometius, Groningen Seaports, Boskalis, Stema, IGL and Primo Marine. An interesting 2 day course for people who received no formal hydrografic training but who do work, or want to work in this field. This course can also be a starting point for a company specific course, allowing for specific requirements to be included. If there is sufficient interest, this course can – on request for a quotation – be given at any desired location.